All of the hardware on the Bahama shutters are aluminum or stainless steel. 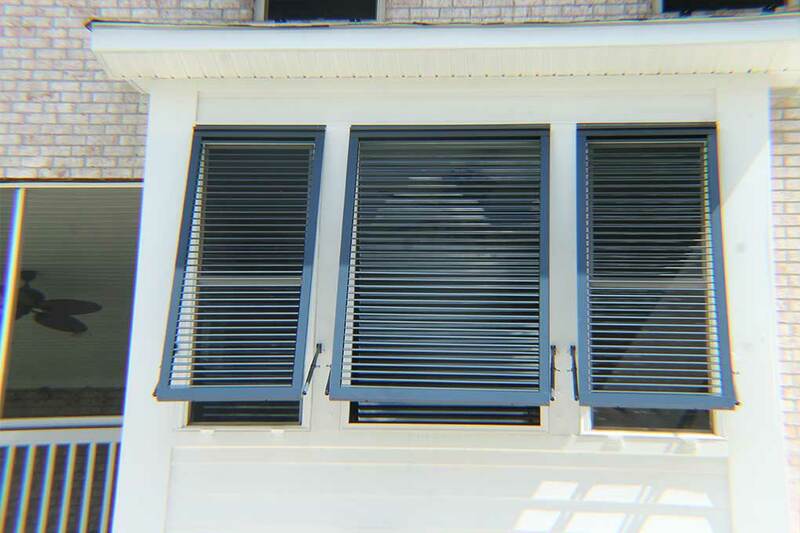 Our rated clear view Bahama Shutters are manufactured by Croci North America in Ft. Lauderdale, Florida. These Bahamas meet state building codes including the new ASTME 1996/1886 standard. Impact rated Bahama shutters have fully operable louvers that give you the option of enjoying a beautiful view or giving you a solid wall of protection. Your shutters will be powder coat painted to the color of your choice. Second floor shutters can be installed to lock from inside the opening, eliminating the need to ladders. 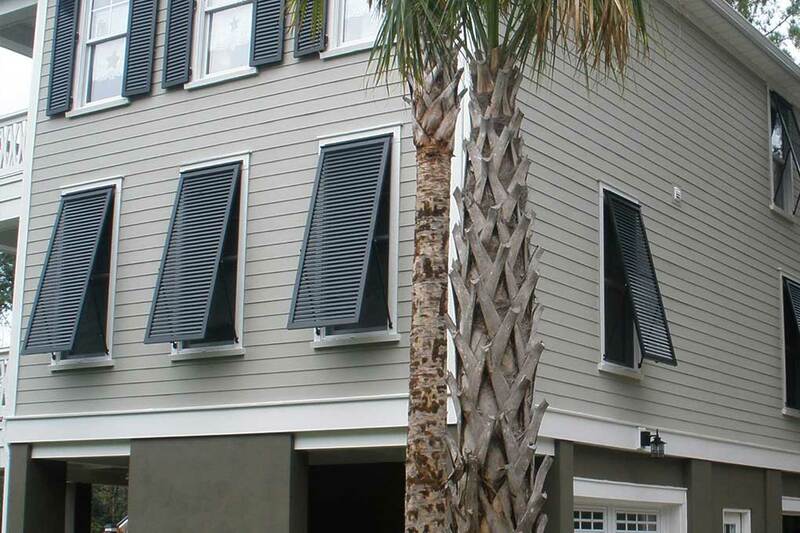 Our custom Porch Bahama Shutters are locally manufactured in our North Charleston facility. 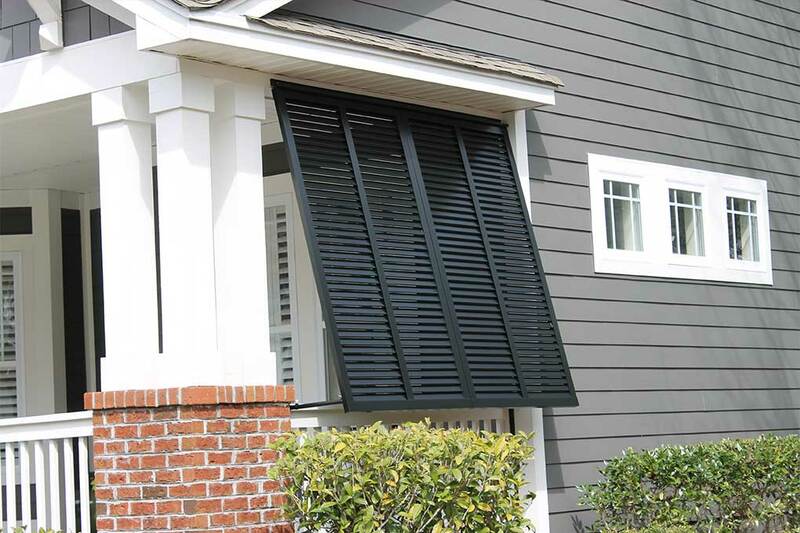 These shutters are used to provide shade, privacy, and to block wind driven rain during summer thunderstorms. Our shutters are constructed from heavy duty aluminum alloy components and assembled with stainless steel rivets and screws for maximum durability. The shutters, hardware, and poles are all powder paint coated to the color of your choice. We typically bring the shutter down to the handrail for maximum privacy and shade. Our non-rated Bahama Shutters are locally manufactured in our Mt. Peasant facility. We use heavy duty aluminum alloy components and stainless-steel rivets and screws in the construction and assembly of these shutters. The shutters and poles are powder coat painted to the color of your choice. Non-rated shutters can be configured to close from either outside or inside the opening. Many customers choose to have shutters installed that open from the inside to avoid having to use ladders.